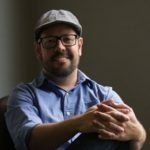 A Guest Article for REVITALIZATION by Jaime J. Izurieta. 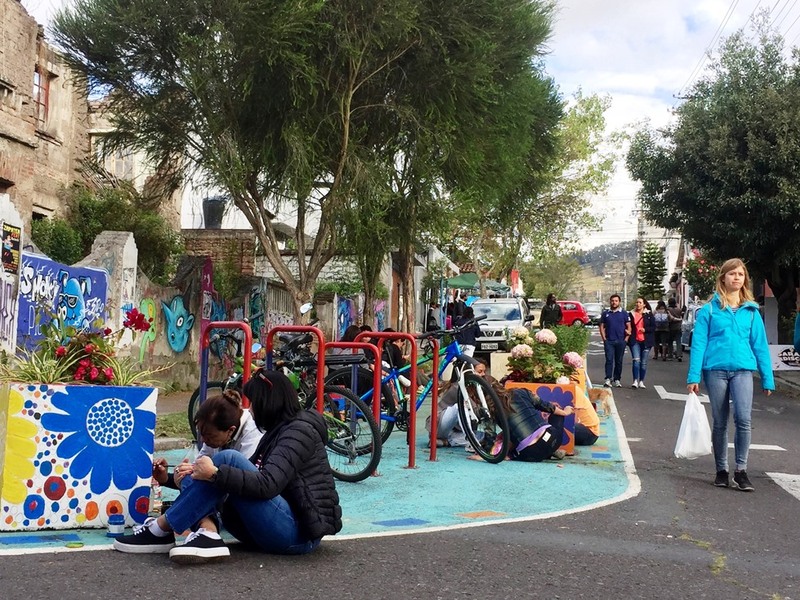 With good ideas, tenacity and a strong partnership among businesses, citizens and the public sector, the Quito, Ecuador neighborhood of La Floresta in the city center has been revitalized. It was transformed from a car-dominated, declining old neighborhood to a safe area that bustles with cultural activity and public spaces that value its history and local character. It’s now far more attractive to tourists and locals alike. Here’s how all that happened. Locals and tourists alike now enjoy the revitalized streets of La Floresta. 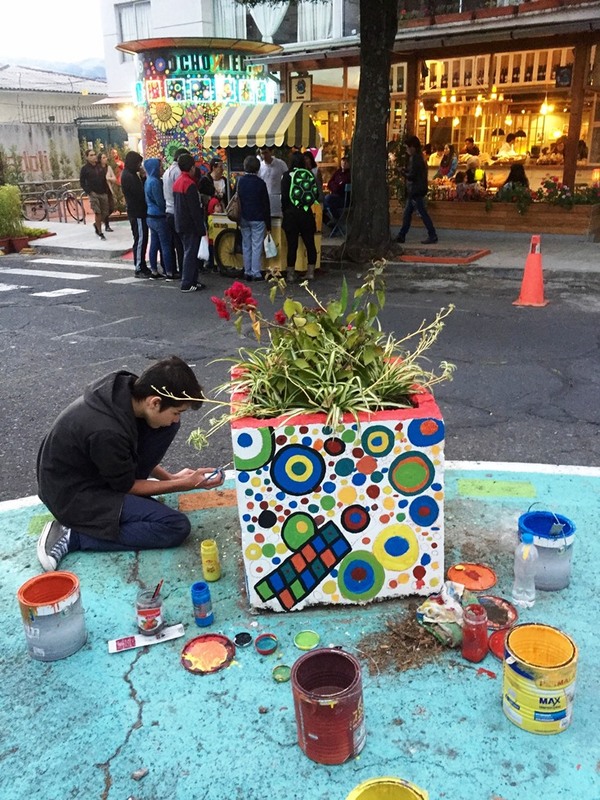 When we take a look at the Facebook feed of local activist Mariana Andrade, we see photographs of children painting huge planters in the middle of the street, students sitting on brightly colored sidewalks, pacified streets with lots of bicycles and outdoor dance performances underneath luscious trees. The photographers’ vantage point of a parklet table surrounded by flowers would have been unthinkable just a few years back. An uncommon sight in Ecuadorian streets, this represent a critical shift from the conventional way in which urban spaces are regarded and used by the public. Ms. Andrade is now part of local lore as the independent movie theater manager and self-appointed cultural minister of La Floresta, an early 20th century neighborhood just north of Quito’s historic core. Along with her, other community volunteers, the members of De la Floresta, a local creative cooperative and community cultural entrepreneurs, my team at the Office of Urban Mechanics set out in 2014 to disrupt those conventions. In the many pictures she posts from Ms. Andrade‘s shopfront, a coffee house within Ocho y Medio, the city’s flagship independent film hall, cars are relegated to the background, color and life pervade the street corners and citizen-led artisan fairs make the air smell like fresh baked cookies many times during the year. 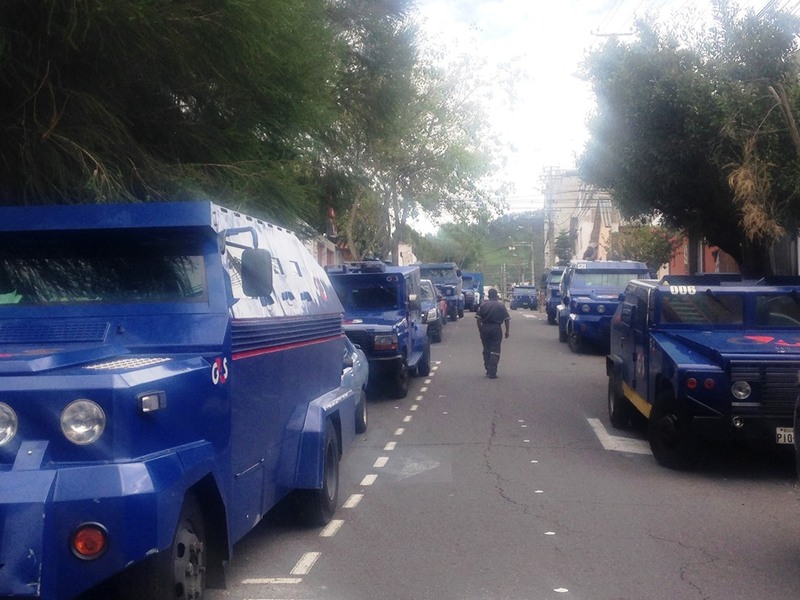 Vehicles from a security company that used the public realm as their private parking lot. The present state of the streets notwithstanding, the process and hardships that the diverse group of public space advocates from both the public and private sector went through to get there have been both exhausting and exhilarating. Up to the starting point of this street transformation story, Placemaking had not been a common idea within Quito urbanist circles. 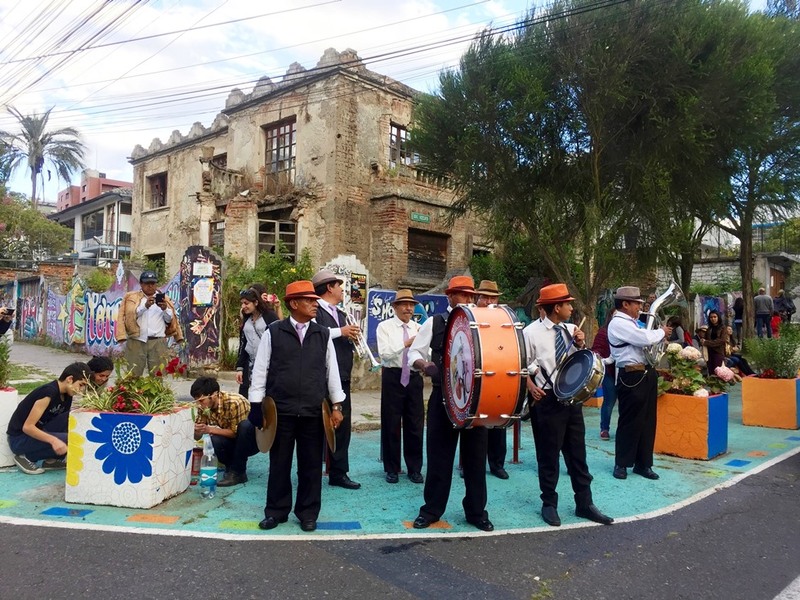 The Minga, a collaborative effort to take on community projects widely found in the Andean culture, is a close relative that had not been tapped as part of the city building toolkit. Its acupuncture-like scope, and its focus on everyday life and ordinary users is inherently incompatible with the media-thirsty, grandiose top-down works that the municipality generally designates as marketing spearheads. With the new municipal administration of 2014 came the great opportunity of founding the Office of Urban Mechanics as an agency thought to be an internal disruptor of outdated practices that affect economic outputs, especially in regard to the use of public spaces, cultural policies and transportation. The ensuing collaborative space was inserted in the Economic Development department of the municipality and I was fortunate to be founding director. We took it as our mission to develop a laboratory to generate our own projects, and reimagine and test pieces of legislation, policies or procedures that put up barriers for innovative small businesses and stifled the local economy. Generating vibrant, prosperous and innovative public spaces was at the same time tool, strategy and objective. Economic, fiscal, and labor policies in Ecuador are set by the national government. Municipalities have very little leeway and raise very little cash on their own. Getting funding from the national level usually depends on whether cities win or lose the lobbying contest. In an exceptional case like Quito’s, where some institutions are conductive to decentralized decision making and finances, there is room for reforms at the local level. Many municipal rules and regulations could be amended to accommodate for disruptive forces that are shaping and growing local economies the world over. Food trucks, ride sharing, new small businesses in public markets, licensing and permitting as well as other areas of potential innovation were targeted by my team at the Office of Urban Mechanics. The mainframe that would allow for implementation of all others was the designation and operation of a Creative Innovation district, located in La Floresta. Lively dialogue at very successful charrette to develop shared vision. Creating a Place-led innovation district was, at first and while on paper, a smooth-sailing task. Political support was gained and the mayor himself backed the proposal. Entrepreneurs and small business owners were delighted that the project would ease the pains of starting up. Local residents were suspicious but thankful that they were included from the start in the planning of the district. Established businesses saw the potential benefits of focusing the city’s attention in their neighborhood. La Floresta is the Quito equivalent of a “streetcar suburb”. Dating from the early 20th-century, it was recently designated as a heritage district. With small blocks, relatively narrow, tree-lined streets and a hefty roster of protected historic buildings, the neighborhood has managed to retain a significant amount of residents and build a slowly but steadily growing housing supply. Since the 1980’s, the human scale of the city blocks, slow traffic, quirky storefronts and historic character attracted bohemians and students from the more than ten neighboring higher education institutions. By the turn of 2000, creatives from all over the country began to concentrate in the vicinity and open studios, storefronts and third places that attracted people in droves. La Floresta became the cultural hub of the city and its largest creative cluster. Formerly car-choked streets have been taken over by bicycles. 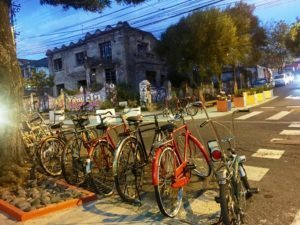 The Creative District project called for a Place-led innovation district built upon the existing creative cluster in La Floresta. The proposal, which included a very thin regulatory layer, took advantage of the potential for developing what the Inter American Development Bank defines as “Orange Economy”. This area of the economy, according to the report’s author Felipe Buitrago, generates a sizable part of the global economic development and improves quality of living by focusing on culture, creativity and identity. A short, in-house study of the creative economy in Quito showed that around one fifth of jobs were in creative industries and one fifth of companies provided “Orange” services. During the second half of 2014, we at the Office of Urban Mechanics set out to complete the preliminary planning for the district. 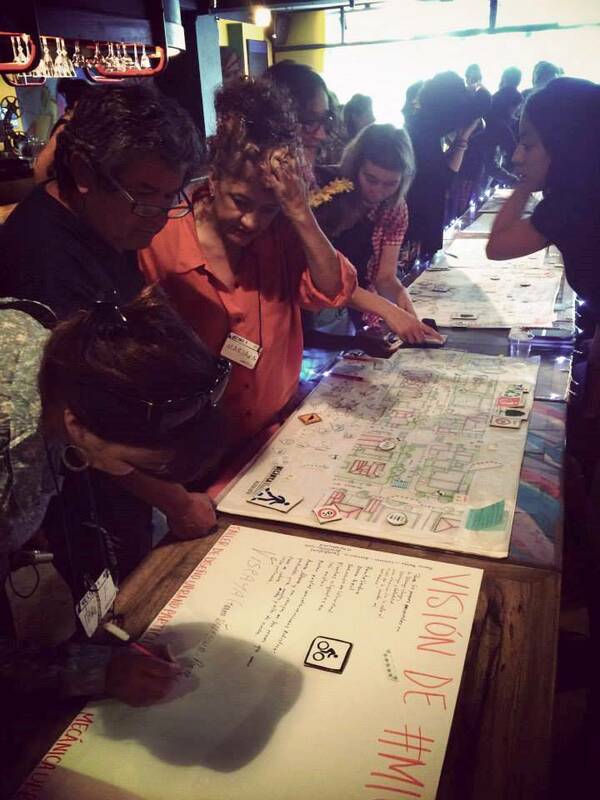 We enlisted local stakeholders with vested interest in the neighborhood: the city’s Economic Development Agency, the Neighbors’ Association of La Floresta, two local universities and a local artists’ collective keen on public space activation. Revitalizing otherwise derelict and abandoned urban spaces was a critical part of the job. Residents had been clamoring for intervention for years. my team and I designed a Placemaking project meant to establish the framework for community outreach and incorporate the lessons from every iteration. Finally, we established a set of key performance indicators linked to the city’s Economic development goals that would help us measure the economic outcomes of public space improvements. Indicators allow us to measure performance, but they rarely paint a clear picture in the long run. Plans might try to provide for that need by establishing periodic evaluations to keep track of a project’s performance. However, outcomes are not usually subject to a conscious evaluation and reformulation process. Knowing that the sustainability of the Placemaking agenda depended on whether public spaces were cared for, we crafted the critical path of the project to reach a point where stewardship shifted from the local government to the residents and business owners of La Floresta. This particular provision in the plan proved a more clever move that we could have expected. New businesses appeared after the street redesign. The interest of the Office of Urban Mechanics was to disrupt the conventions of how projects, particularly those affecting the quality of urban spaces, were planned, executed and maintained. Local eateries and coffee shops were encouraged to set up parklets, bicycle parking and outdoor sitting as a guerrilla urbanism effort to pressure City Council to sanction more creative uses of public space. Breaking through the Red Tape was one of our first victories. It established a new paradigm for the streets redesign process, which we christened #MiCalle, meaning simply My Street. Light, quick and cheap were the principles that guided the participatory design process. Invitations were sent from the Office of Urban Mechanics for local residents to send their ideas for street improvement. An expanded, first community meeting brought all the ideas to the table and the final ones that would be implemented were entirely decided by the locals, as well as the area of intervention. Finally, a busy charrette, attended by local residents, politicians, activists, entrepreneurs and property owners helped zero in an actual project that was presented to the municipal Public Works Company. Streets were then transformed by reducing design speeds, bulging sidewalks, improving crosswalks, building swales and introducing vegetation, trash cans, bicycle parking and parklets. Recycled materials, repurposed elements and volunteer labor from the neighbors allowed the implementation to finish while operating on a budget of only $50,000. The timeframe for the innovation district that #MiCalle kicked off could not have been better. Quito’s many public agencies were hurrying to coordinate a joint effort to show their best to the world during Habitat III, still a year and a half away at that point. Public spaces were a natural choice and municipal resources were poured into the beautification of streets and open spaces. The scope of the city’s idea, however, was different from the one in the district plan. The municipality pushed for a top-down implementation package, inherently incompatible with a Placemaking approach that would have guaranteed the governance and sustainability. Rather, designs were mass produced behind closed doors by small teams and construction advanced as an assembly line, with the city’s own contractors. In the big city of Quito, events in La Floresta have a small town feel. Habitat III showed a beautiful face of Quito. To foreign dignitaries passing by, the image was of a thriving city with manicured parks and street trees. To activists and journalists who took the time, inconsistencies and lack of participation were evident. In the particular case of #MiCalle, time lapsed between the charrette and construction and the pre-H3 trailblazing beautification saw a decline of interest in the concept behind Place-led innovation. Then came the formal end of the innovation district project. The most useful lesson learned was that the key is to keep the politicians’ interest intact while periodically having to resell the idea to an ever-changing army of skeptical advisors with their own agendas who compete for their bosses’ ears. I hinted earlier that proposing a Place-led, participatory process with a planned takeover by the citizens ended up being a clever move. It was. Since both the Placemaking initiative and the district plan derailed, the lack of interest from the public sector sent many different private initiatives into overdrive. Festivals, bike rides, street performances and outdoor markets activated the redesigned streets and children from nearby schools made planter painting a favorite field trip activity. Thriving businesses have opened in the vicinity and established ones have gained traction with the community as well regarded third places, such as the cafe at Ocho y Medio, where this story began. The process of appropriation by the community has been a planner’s dream and a successful meeting of one of the original project’s most ambitious goals. After three years it is possible to see the project in perspective. La Floresta has been upgraded from the neglected, gritty but rich and diverse cultural heart of the city to a Place of congregation, a destination for tourists, artists, designers, filmmakers and architects, where local families have taken back their public space and where children can feel safe once again. I like to say that the fact #MiCalle became so popular even after the city abandoned the project after implementing the street redesign is a sort of vindication. Neighborhood residents, entrepreneurs and community leaders saw the potential of collectively planning public spaces. They also had first-hand experience with low budget implementation of high impact urban elements and, perhaps most importantly, after the success of many activation initiatives, they now feel confident that it is possible for private citizens to push the envelope and bring great changes in the way we see and use our public spaces. All photographs are by Mariana Andrade. Jaime J. Izurieta was born in Quito, Ecuador in 1975. He is an urban and architectural designer, a town planner and a Placemaker. 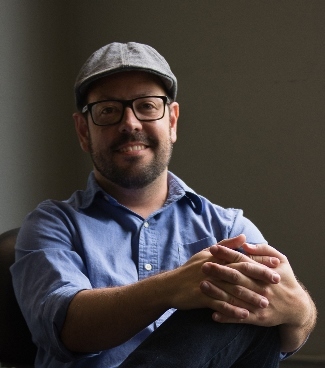 Jaime works with local governments, NGOs and small businesses to bridge Design and Local Economic Development from his own consulting firm based in Quito, Ecuador since 2007 and in South Florida since 2017. He has a Masters in Urban Management and Development from IHS Erasmus University Rotterdam, Netherlands. M.Arch and M.F.A. in Historic Preservation from the Savannah College of Art and Design. Member of the Congress for the New Urbanism and the Placemaking Leadership Council. Project for Public Spaces Fellow for Latin America. Currently cracking zoning codes at Gridics, a real estate intelligence startup.